Rebecca Stevenson, a renal staff nurse and diabetes link nurse from Ward 32 at the Doncaster Royal Infirmary, has led significant changes since she began her role nine years ago. Changes on the ward have been introduced to help improve care every day through creative ideas. Examples of these include the Practice Injection Box which allows people with diabetes to practice injections on an injection pad. They also developed diabetes packs crammed full of information to support the patient’s education and they also created posters created with different aspects of diabetes care covered. To mark this year’s campaign a special Hypo Awareness display was set up and a hypo scenario quiz was issued to all qualified staff for training and revalidation. 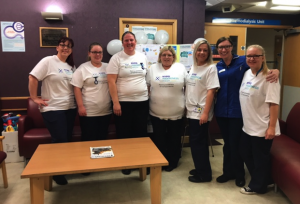 They also created their own hypo prevention proactive information sheet, which was distributed to staff to help them recognise and prevent hypo’s as well as reminding staff of the hypo treatment. The whole team wore their Hypo t-shirts on the ward which helped boost engagement and among both staff and patients. As a team they work constantly to improve diabetes care every day and also get involved in the completion of the National Diabetes Inpatient Audit to see what improvements they can make based on the results they receive.